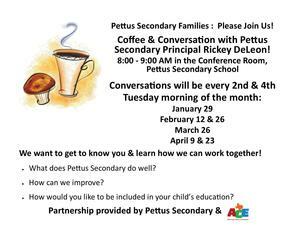 Coffee & Conversation with Pettus Secondary Principal, Rickey DeLeon! We want to get to know you & learn how we can work together! Our entire bus fleet was vandalized over the weekend. Bus transportation will resume tomorrow using buses from Three Rivers ISD and Karnes City ISD. We are accepting referrals for the GT program for grades K-12. If you would like to refer a student who demonstrates intellectual and creative thinking abilities at an extraordinary level, please fill out the attached referral form and return to me by January 31, 2019. Here is the elementary supply list for 2018-2019. Supplies may be brought on "Meet the Teacher" Night or on the first day of school. Secondary students will receive their supply list on the first day of class. You will find our list at the Walmart and HEB in Kenedy and Beeville. Today’s open house at Pettus Secondary has been postponed.